Do You Wear a Personality Mask? I’ve worked with many women whose personality types did not accurately reflect their authentic design. For a variety of reasons, they scored themselves as they believed they should be or could be, rather than who they are. 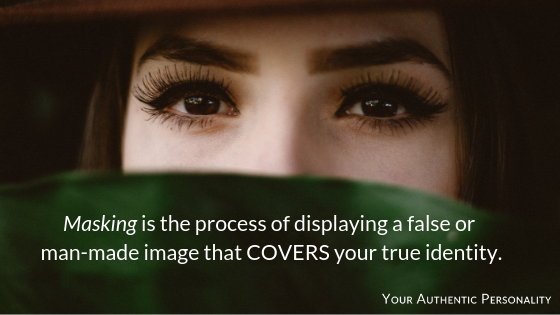 Masking is the process of displaying a false or man-made image that covers your true identity. Like the actors in ancient times, you wear a mask to become someone else. And you may not even know you’re doing it, in fact I doubt you do. Masking isn’t usually conscious. But it does happen every day, especially for women. Laura, a client and mom of two, didn’t believe she was a Connecter because she had always been a perfectionist, maintaining a perfectly ordered home with everything in its place (classic Improver tendencies). Laura cleaned obsessively, not because she delighted in cleanliness and order (the sign of a true Improver), but because she desperately wanted to please and connect (Connecter motivations) with her Improver mother. Laura had learned to clean well to gain her mom’s approval when she was young. Parental slice bias, the tendency to prefer one personality over another, can breed contempt for your true self when your siblings’s qualities are favored over your own, causing you to morph. Also, criticism, neglect, and any type of emotional, physical, or sexual abuse cause us to mask. These painful experiences force our true selves into hiding as we cover up who we are in order to cope or survive the events of childhood. Masking occurs in our relationships. We mask to conform to social pressures and unrealistic expectations, like when others expect us to entertain the masses when we’d rather just read books. We can mask when our job requires us to develop skills that are way out of our wheelhouses. We can mask when we find ourselves in hard marriages, doing anything and everything to improve the relationships. These adaptations become masks when we accept them as who we are. Ask your spouse or a good friend, who knows you well and likes you lots, to share the qualities they see in you. See if they line up with what you know of yourself. Read about all four personality types in What’s Your Mom Type? to learn more about common strengths, weaknesses, fears and needs inherent in each one. God has designed you with a singular type or a particular blend. That truth cannot be shaken. Let Him lead you to the authentic version of you that He made in the beginning and will delight in at the end.